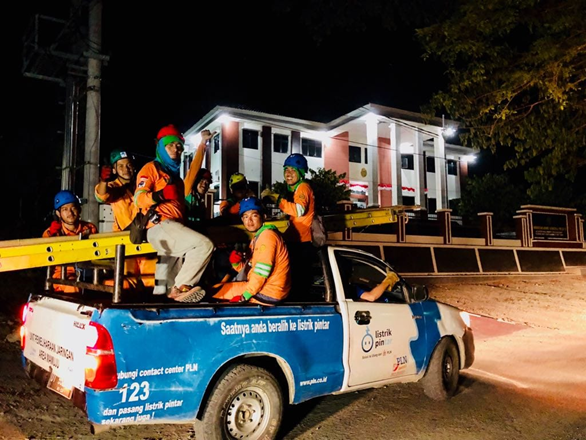 PALU - The Ministry of Energy and Mineral Resources (ESDM) ensures the handling of electricity and the supply of fuel oil (BBM) after the earthquake in Palu, Donggala and Sigi went well. The Disaster Alert Disaster Command Post reported that until 8 October 2018 the electricity supply returned to normal, as many as 1,301 personnel were directly involved in normalizing the electricity system. Meanwhile, the distribution of BBM runs well after the General Fuel Filling Station (SPBU) which operates for 24 hours. "There are already eight gas stations operating all day long," explained the Head of the Communication Bureau, Public Information Service and Cooperation of the Ministry of Energy and Mineral Resources, Agung Pribadi in Jakarta, Monday (8/10). A total of 19 gas stations have also been operating, 15 of which are in the city of Palu. For LPG needs, the Government has coordinated with Pertamina to conduct market operations to cover LPG agents that are still closed. The Ministry of Energy and Mineral Resources also continues to drill wells as a means of providing clean water, especially in evacuation sites and public facilities, such as hospitals. "Based on the report tonight, shallow well drilling has been carried out for the provision of clean water for Evacuation Command Post in Kabonga Besar Village, Banawa District, Donggala Regency. In this location are refugee posts, 135 households (58 families) with 582 people directly affected western tsunami, "continued Agung. In the Kabonga Kecil Village area, RT 03 RW 02, Batumaluli there are also 150 households, where refugees find it difficult to get water. Drilling will be carried out the next day on 9 October 2018. This afternoon the preparation point has been carried out at the location concerned. "While at the Hospital the Biromaru Roundabout Field has now entered the settlement process," he said. At the same evacuation post for the ESDM Office in Central Sulawesi Province, drilling with a depth of 11 meters entered the completion stage. The Ministry of Energy and Mineral Resources through the ESDM Disaster Preparedness Command Post also continues to strengthen personnel to accelerate evacuation, revitalization and rehabilitation at the disaster site. 350 people were recorded as having continued to work together to provide assistance, both in terms of rescue, medical, to operators. "This team comes from the ESDM sector companies which are under the coordination of the MEMR Disaster Preparedness Team and still growing," Agung said.